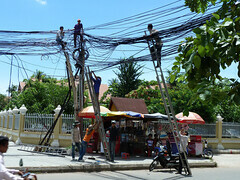 Electrical cables, Phnom Penh, Aug 2011 by judithbluepool, on Flickr. If Scotland votes yes, the consequences could be messier and nastier for longer than most of us have allowed ourselves to consider. […] If a yes victory is declared, how will the British Labour party, meeting for its party conference on the following day in Manchester, react? By promptly agreeing to expedite Scotland’s departure? Dream on. A yes vote would explode into the UK party conference season. All the main parties would be destabilised in major ways. It appears that London-based commentators have only just started thinking about the consequences of a Yes vote, and they’re shocked by how much it’ll change Westminster. It’s probably also in this context that one should see Benedict Brogan’s promise that David Cameron will resign after a Yes vote. I’m not so sure things will be that messy. Of course, it’s likely the UK party conferences will be quite chaotic following a Yes vote. The Tories can perhaps focus on whether their dear leader will stay in power, but both Labour and the LibDems will need to look at how to give their Scottish members independence within the party. It’s clearly unacceptable if UK Labour is telling Scottish Labour how to negotiate for independence, and they also don’t want Scottish votes swaying any decisions on the rUK negotiation mandate. However, once the conference season is over, I expect Westminster will get down to business. Not doing so would be a dereliction of duty. Salmond talks as though the negotiations following a yes vote would be straightforward, respectful and informed by mutual trust. Why should that be so? They would more likely be devious, antagonistic and riddled with mutual suspicion, as well as largely meaningless until after the 2015 general election. I don’t understand why the negotiations would be “largely meaningless” for the first six months. Surely if some areas had already been agreed on, a new government wouldn’t start renegotiating them. However, I’m not quite sure whether it would be possible to conduct a sensible general election campaign while the negotiations are ongoing. Wouldn’t it be much better to create a national unity government in Westminster to match Scotland’s all-party Team Scotland? The general election could then be held after Scotland had become independent, which would allow the campaign to be about “normal” politics — schools, hospitals, the economy and Europe — instead of turning into a fight about who can be toughest and roughest in the independence negotiations. Whether Salmond was negotiating with Cameron or Ed Miliband (and it is worth remembering that if Labour wins in the UK in 2015 and then wins in Scotland in 2016, Labour could in fact be negotiating with itself), the process would be likely to be prolonged. The UK government would have every possible incentive to drive a hard bargain with Scotland, as Hammond made clear in the defence context this week, and it would be backed by public opinion. As I’ve written about before, most nations negotiating their independence from a larger country in the past spent significantly less time than 18 months (typically between a few days and six months). Surely the SNP’s proposal is the longest amount of time it is possible to put normal politics on hold, so if London-based commentators are suggesting it’ll last much longer than this, it must mean they’re expecting the independence negotiations to be an ongoing sideshow rather than the government’s main focus. Could it be that Westminster politicians are planning to tire out Scotland until we agree to keep Trident and all that? If so, Scotland will have to simply declare independence unilaterally (UDI) and negotiate the details afterwards. The negotiations will only drag on for years if it’s deemed necessary to reach agreements on absolutely everything before independence day. Of course, a few things will need to be fleshed out — citizenship and dividing the military perhaps — but in most areas it should be possible to state that it will continue to be shared until an agreement has been reached, together with some general rules about conflict resolution, arbitration and such things. Meanwhile, what about the public mood? Views will not remain frozen unchangingly once the result is in. Nor will they inevitably remain benign and peaceful. Nationalist opinion could become more militant if the talks become bogged down. Even acts of violence are not inconceivable in certain circumstances or places, as anyone with a smattering of knowledge of the Irish treaty of 1921 will grasp. There are no signs whatever that Scotland will turn violent after a Yes vote — the independence movement is uniquely peaceful and optimistic, and this would only get better after a Yes vote — so this sounds worryingly and dangerously like wishful thinking. The moment a Yes is declared, the entire British machine moves into diplomatic mode. The first act is to be magnanimous by accepting the result with good grace. The second is to set the tone by appearing reasonable and, even while doing their utmost to get the best deal they can, they will present to the world an image of refined Brits maintaining their dignity. To be brutally frank, the loss of Scotland is the last vestige of a once ‘great’ country slowly sinking below the horizon. They must at all costs pretend the opposite is true, that this is a blip and nothing more. As part of this image of refined Brits maintaining their dignity, and to concentrate minds and ensure that the negotiations will be finite in duration, I think it would be useful to establish two ground rules straight after a Yes vote: (1) Westminster should agree to a legislative moratorium whereby they agree to legislate as little as possible, and only with the consent of the Scottish Parliament, until Scotland is independent. (2) The two countries should agree that independence will happen no later than 24th March 2016, whether the negotiations have finished or not. Those two rules in conjunction should ensure that the negotiations proceed smoothly and successfully. The reasons for the proposed legislative moratorium are twofold: Firstly, it would of course be crazy for Westminster to pass laws that Holyrood will simply repeal a few months later, and secondly, without it Westminster might find it tempting to focus on other policies that would be of more interest to the rUK public. If the main Westminster parties decide to be reasonable and work constructively to finish the independence negotiations quickly and positively as outlined above while putting normal politics on hold, I don’t see any reason why the time between a Yes vote and independence day should become an absolute mess at all. Great blog Thomas Widmann. I think we “foreigners” see things a bit differently than many Brits. I don’t see why it would be in Westminster’s interest to prolong and muddle negotiations with an independent Scotland. Anyway, it’s Scotland who will be in the stronger position, not rUK. “An Absolute Mess?” http://t.co/z5DDfyem0L @arcofprosperity on how rUK might/should approach post-yes negotiations. RT @naebD: “An Absolute Mess?” http://t.co/z5DDfyem0L @arcofprosperity on how rUK might/should approach post-yes negotiations.